A grey rapid hardening, flexible, fibre reinforced adhesive mortar for fixing all types of ceramic floor tiles in external and internal situations, including swimming pools. The mixed mortar has an easily workable consistency to facilitate floor tile fixing. The mortar adheres strongly onto concrete and cement:sand screeds, including heated sub-floors. Ultra rapid setting and hardening – walk on and grout after only 90 minutes. 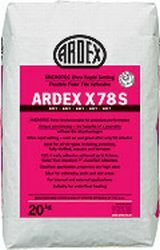 Solid adhesive; consult ARDEX’s technical literature for details and fixing guidance.